Over the years, there has been a lot of talk about flat and arched feet. In these conversations, people with flat feet usually got the short end of the stick because it has largely been considered as a disadvantage. In the past, people with flat feet have even been barred from joining the military owing to this condition. However, most people are still not familiar with the concept of flat feet or how it comes about in the first place. How Can You Tell If You Are Flat-Footed? What Are The Most Common Symptoms Of Flat Feet? What Are The Medical Implications? Flat feet are commonly known as fallen arches or pes planus. It refers to a condition where the base of your foot is almost in complete contact with the ground. When this happens, it means that the arch that is supposed to be at the base of your foot did not fully develop which caused it to be lower than what is medically considered as a normal arch. The case of the point at which an arch ceases to be normal and is considered flat is still in dispute. Research has shown that the size of the arch varies with different kinds of people. While they are still wet, step on a surface that will leave a footprint (for example a concrete surface). If you find that the sole of your foot is almost fully visible, it means that there is a high chance that you may have developed flat feet. If a significant part of the footprint is missing, it means that you do not have flat feet. A different way of finding out is to stand on your toes. 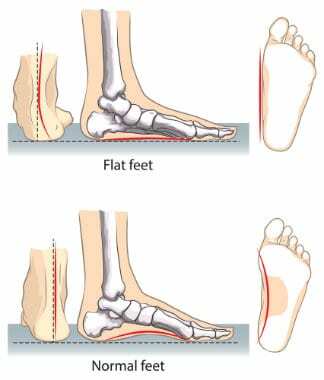 If arch forms, it means you do not have flat feet. If an arch does not form, you may need professional assistance to come to an accurate conclusion. These tests are simple and easy, but the accuracy of the results will be determined by your perception and understanding of arches. For a more comprehensive result, it would be prudent to visit your local clinic. When we are born, we all have flat feet. As you may have noticed, babies usually don't have any kind of arches on the soles of their feet. However, as a child develops, the tendons of the foot grow tighter which allows the arches to form. It takes the entire length of your childhood for the arches to form, so it is not easy to tell whether someone will have flat feet or high arches before they reach their last teenage years. If the tendons in your feet are not strong enough, they will not pull together to form the arch which will, in turn, cause flat feet. Loose tendons﻿﻿ may be caused by hereditary diseases such as Marfan syndrome or Ehlers-Danlos syndrome. It is important to check for these syndromes if you would like to know whether your children are at risk of developing flat feet or not. Excessive pronation (The foot does not raise and lower the arch, as it should when walking or running). Thus far, very few people have come forward with complaints about aches and pains that are directly caused by flat feet. Most people are able to live their entire lives without experiencing any discomfort because of flat feet. If you experience pain while walking, running or standing because of flat feet, it may indicate that the condition has advanced and you may need medical attention. For minor cases, you may only need special shoes, special insoles or a few sessions of physiotherapy. If the condition is advanced, doctors may require to perform surgery to correct the positioning of the joints n your foot and to repair the loose tendons. In conclusion, having flat feet is a common and often painless condition. It is extremely rare to find a case where your life will be severely disrupted because of fallen arches. However, if you have experienced constant pain whenever you are on your feet, do not ignore it. Visit your local health center and seek medical advice from a professional. Do you have any questions or comments on today's topic? We would love to hear them! Please leave any views you may want to share with us in the comment section below.